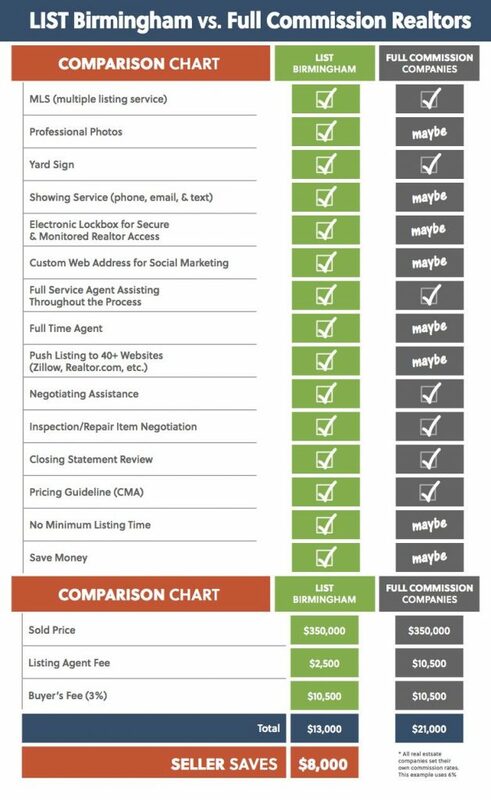 Selling a house in Birmingham just got easier. Let our experienced staff help you make it happen. At LIST Birmingham we understand that buying a house is a big decision! LIST offers you a full service real estate agency at an affordable price without sacrificing our commitment to service. To accomplish this we allow you to sell your house in Birmingham for a flat fee. That’s right! Instead of the steep commission based percentages that competitors offer, LIST believes in bringing you a higher level of service at a more affordable price. Our experts are well aware that affordable houses for sale in the Birmingham area are not easy to come by! That’s where LIST Birmingham can help. Historically, our average client saves over $8000 in commission. Think about all the ways savings this high could be used! Whether the savings are used towards the down payment or closing cost on your next home, paying off student loans, or an awesome vacation, the important thing is that these homeowners are holding onto a lot more cash when using LIST Birmingham to sell a house. In short, you get more than what a full-commission company offers and you save money at the same time. Contact LIST Birmingham today to list your home with confidence – and save.